Sound familiar? The minute you say no, or set limits, or try to enforce the rules, your child immediately says that you’re not being fair and that you always pick on him. He overreacts constantly to routine requests and takes no responsibility for his behavior. No matter the circumstances, he is always the one who has been wronged or unfairly put-upon—in other words, the victim. If this is a pattern—your child’s typical response—she is displaying a victim mentality. And she does so because it gives her an excuse for her bad behavior that works for her. When your child thinks like a victim, he will begin to feel and act like a victim. If left unchanged, the victim mentality can eventually impact your child’s ability to have healthy relationships and to adequately function as an adult. When children take on a victim mentality, it becomes a form of defiance, used to avoid taking appropriate responsibility and being held accountable. And when it plays on our emotions as parents—getting us to question whether, maybe, we have been too tough or unfair, or making us feel guilty about any limit we try to set—rules are forgotten, limits ignored, and we lower our expectations. If left unchanged, the victim mentality can eventually impact your child’s ability to have healthy relationships and to adequately function as an adult. It is vital that your child learns new skills in order to manage responsibility in the real world. To start that process, it’s helpful to look at the behaviors that lead to the victim mentality. Thinking errors, simply put, are patterns of thinking that are inaccurate or irrational; they influence our feelings and behavior, often in negative ways. In other words, when your child thinks like a victim, he will begin to feel and act like a victim. Below are some of the common thinking errors that fuel your child’s victim mentality and its related behaviors. Over time, parents hear these excuses, see these behaviors and get pulled into believing that it must be true. Then you start responding to your child’s unhealthy behavior in unhealthy ways. You tiptoe around your child because you can anticipate the response you’re going to get. You know your daughter is going to start yelling the minute you remind her she needs to babysit. You wonder if you should just stay home; it might even be easier than having the big fight and the risk that she’ll take out her anger on her little brother. These thinking errors can also lead to a sense of fatalism on your child’s part: he actually begins to believe he can’t change, that your expectations are beyond him, and that he is unable to take responsibility for his actions. He then becomes unable to see his role in making things better. It’s important to avoid this fatalistic trap by reminding yourself that change can happen at any time. Start with targeting one behavior at a time. Identify something that is making life difficult for you, but also something that you think can really change. For example, you could start with a reasonable wake-up time and morning routine, or follow through on a chore, or expectations that meals will be civil, with no screaming allowed. Be calm and matter-of-fact in your delivery, as your child is so used to overreacting to any expectations or limits. Think of what you’re doing as all business. The limit setting parent role works best when you are non-emotional. Don’t expect that your child will take kindly to this, though. In fact, they may be quite resistant, but stay calm and focused through the initial challenges. Don’t give up on expectations and consequences—and don’t give in to bad behavior. It takes a long time to relinquish the victim mentality and replace it with a more responsible way of thinking and behaving. It’s become a habit for your child, and parents often develop habits in response. It’s easy to fall back into these habits and to think that rather than setting this limit and dealing with my child’s defiance, I’ll back off this one time and let it go. This is natural. We all try to avoid things that feel like work, but in this case the work is worth it. Provide positive reinforcement when your child takes responsibility and makes good choices. 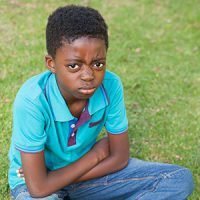 The changes may be subtle at first, but the minute your child starts taking responsibility for his actions, he’s beginning to shed the victim mentality. He’ll need encouragement to keep changing his thinking and taking on healthier problem-solving skills, and you can provide this. Remember: change doesn’t happen overnight. Once your child realizes that there is really going to be a change in expectations, they will slowly begin to meet those expectations. And once the change begins, additional behaviors can be addressed and expectations added. Keep in mind the goal of all this work: to raise our kids to be responsible adults, able to function in life and to solve the problems that come up along the way. Feeling and acting like a victim will not lead to the kind of adult life we want for our kids. But once your child has learned to take responsibility for their behavior, they will feel better about themselves, be better able to solve problems and make the most of their life.